If you are looking to sell your house due to Japanese Knotweed, simply enter your details for an instant online cash offer. We buy any home, in any condition, even if it has failed a survey due to Japanese Knotweed. Japanese Knotweed or Fallopia Japonica is one of the most high-profile and damaging invasive weeds in the UK, Europe and North America. It causes millions of pounds of damage to property, infrastructure, roads, sewers, bridges, walls, flood defences and buildings across the UK annually, combined with millions of pounds spent in an endless fight to control and eradicate the spread of the non-native species. It was originally imported into the UK as an attractive ornamental plant. It has no known natural enemies in the UK. Anyone that has come into contact with Japanese Knotweed will appreciate how unwelcome this particular type of plant is. It can spread at a ferocious rate, and because it can penetrate through concrete, mortar and brickwork, it can cause extensive structural damage to properties, both residential and commercial. Japanese Knotweed is considered so damaging that it is an offence to plant or cause Japanese Knotweed to spread in the wild under the Wildlife and Countryside Act 1981. All waste containing Japanese Knotweed comes under the control of Part II of the Environmental Protection Act 1990. It is listed by the World Conservation Union as one of the world’s worst invasive species. A recent estimate puts the cost of control, were it to be attempted UK-wide, at over £1.5 billion. These control methods, which rely mainly on chemicals, have been deemed unsustainable by many, so a longer-term solution to the problem is required. Swansea is one of the worst affected areas in the UK. Here alone, the cost of completely treating the infestation using chemical or manual treatment (£1 and £8 per sq/m respectively) would cost around £9.5 million. With the current rate of treatment standing at 2ha per year the current infestation will take 50 years to treat without accounting for its rapid spread to new areas. In the early spring, red or purple shoots appear from the ground and grow rapidly, forming canes. As the canes grow the leaves gradually unfurl and turn green. The plants are fully grown by early summer, and mature canes are hollow with a distinctive purple speckle, forming dense stands up to 3 metres high. The plant flowers in late summer, and these consist of clusters of spiky stems covered in tiny creamy-white flowers. These provide a good source of nectar for insects. The seeds are rarely fertile, and in Britain, the plant spreads mainly underground via rhizomes. The canes can arise from the rhizome which grows underground, from an existing crown, where previous growth has taken place, or from a cut stem. During the late autumn/winter, the leaves fall, and the canes die and turn brown. The canes remain standing throughout the winter and can often still be seen in new stands in the following spring and summer. Japanese Knotweed thrives on disturbance. Pieces of rhizome or stem can be spread by fly-tipping or carried by waterways, especially after heavy rains or flooding. Thus, clusters of Japanese Knotweed are often found on riverbanks, roadsides and re-development sites. Careless land owners can easily spread the plant on wheels of vehicles, and homeowners unwittingly chop it down and dispose of cuttings or contaminated soil which are then disposed of on uncontaminated areas of garden, compost heaps, neighbouring land or fly-tipped aiding its spread even further. Experts have warned that the winter of 2015/2016 was one of the wettest and warmest winters on records and a massive surge in Japanese Knotweed growth is expected due to the favourable weather – The Evening Standard warned Londoners in March 2016 “London to be hit with surge in destructive plant Japanese Knotweed after warm winter.” Reports up and down the UK show that spring growth gets earlier and earlier every year. Apart from the structural damage it can cause, the most common problem comes with selling your property if you have Japanese Knotweed in the garden, on your land, neighbouring land or in many cases within a few hundred metres – chances are if this is picked up on a survey or mortgage valuation your sale is done for! Bear in mind it is illegal to hide or fail to disclose an infestation of Japanese Knotweed in your garden or land. 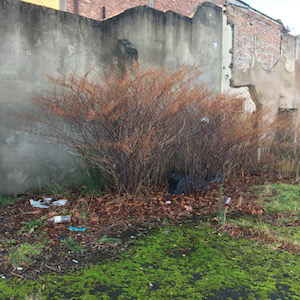 We are often called in to purchase homes where Knotweed has been found during a survey. In most cases, a purchaser has agreed to buy a property, and the seller had failed to declare (probably innocently) the presence of Japanese Knotweed in the rear garden or in an adjoining garden. The mortgage lender refuses to lend on the property and even worse it means a substantial loss for the purchaser, especially if they wished to extend the property and do other works, which the Knotweed would impact on – they would have to wait for 3 years and possibly longer before they could extend the house and be certified free of this devastating weed. Not surprisingly the buyers tend to pull out of the sale. If you suspect that you have Japanese Knotweed on your property (or wish to report a site), then you should contact the local authority or Environment Agency, who will advise you on what to do. They will most likely arrange for the area to be inspected by a competent professional to establish if there is Japanese Knotweed present and if so, the extent of the problem. Fence off the infested area, and erect warning signage. Do not flail or mow Japanese Knotweed as this will cause it to spread. Do not chip Japanese Knotweed material. Mechanical chippers do not kill Japanese Knotweed. If you spread the chipped material on soil, Japanese Knotweed could re-grow. Do not add Japanese Knotweed to compost. Do not waste time. If Japanese Knotweed appears in your site, treat it immediately. Do not allow it to become more established. We always advise you use licensed professional insurance backed specialist contractors to treat, eradicate and remove Japanese knotweed. It is not an easy plant to control as the extensive underground rhizome system sustains the plant even when top growth is removed. Therefore treatment often needs to be repeated multiple times a year for several years for long-term control to be achieved. Be aware of the risks involved when using chemicals to control any plant especially if it grows near water. Consent to use specific herbicides near UK waterways must be sought from the Environment Agency. If there is no risk of run-off to watercourses and where no sensitive vegetation will be affected, a wider range of herbicides can be used. These are usually sprayed on – but can also be applied directly to target plants using a weed-wiper or herbicide glove. Some herbicides can also be injected into the hollow stems of the plant immediately after cutting. However, this is time-consuming and costly. 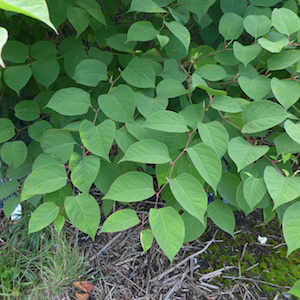 Repeated herbicide treatments over several years are normally recommended for complete control of Japanese Knotweed. Continued monitoring of the treated areas should also be carried out to ensure that no new shoots appear. For short-term control, Japanese knotweed can be cut, taking care that fragments of splintered stem are not spread. However, this will not eradicate Japanese knotweed, and the plant will continue to grow once cutting ceases. Japanese Knotweed can regenerate from very small fragments of rhizome (as little as 0.7 grams) and any waste material from cutting, mowing or excavation, should be disposed of according to the Environmental Protection Act 1990 (Duty of Care) regulations. Equipment that is likely to result in further spread of Japanese Knotweed, such as a flail mower should not be used. Natural (or biological) control, is the use of living organisms to control pests. Given that the natural enemies of Japanese Knotweed are not indigenous to the UK, natural control is a means of levelling the playing-field by re-introducing some of the specialist natural enemies that would normally control it in its native environment. The decision was taken on 9 March 2010 in the UK to release into the wild a Japanese psyllid insect, Aphalara itadori. Its diet is highly specific to Japanese Knotweed and shows good potential for its control – although we must stress this is a form of control, not eradication and it can take five to ten years from release to achieve successful control. If you want to find out more about how you can manage Japanese Knotweed, visit the website of the Environment Agency. If you are trying to sell a house that is affected by Japanese Knotweed, whether it has failed a survey or another sale has fallen through, you can simply sell the property fast to 365 Property Buyer. We buy any house with Japanese Knotweed for cash and can complete in just five days. Simply fill in the property postcode for an instant online cash offer.